Growing up, quiche was never part of our regular dinner rotation at home. If my mom couldn't cook it in a wok, it probably wasn't making it to the dinner table. And thank goodness she wasn't brave enough to try that. Yet, I still have some oddly vivid memories of quiche. I think it started in high-school, when I spent two years working part-time at a high-end tea store. My job actually involved describing which flavor of quiche paired best with the customer's tea selection…(I wish I could tell you that was a joke – it's not). I spent so much time talking about, prepping and serving quiche that at best my position on them was one of indifference. That all changed in university, when I discovered Costco-sized packs of frozen pie crust. And let's not forget about those massive cartons of eggs. Very quickly, I became quiche obsessed. I would bake up multiple quiche and eat them throughout the week. Some days I would have a slice for breakfast, a slice for lunch and a slice for dinner. For a time- and cash-strapped student, it was perfect. But as you might expect, my infatuation with quiche quickly died down after I moved on from my university days. Not only was I bored of consuming my body weight in frozen pastry and eggs, but now I was actually making some money! And as quickly as quiche had re-entered my life, it was now gone. But like any good romance movie, we obviously get back together. And that's the fun part! Recently, I've been playing around with gluten-free pie crusts. And, after having much success with a sweet version for my mom's birthday, I decided that a savory version should work as well. Since you're probably up to your eyeballs with holiday meal planning, I figured I'd save you the hassle of a finicky roll-out crust. That's right, we're going to rock a delicious, savory press-in pie crust for this recipe. There's no flour, kneading or even rolling pins involved. How easy is that?! And not only is this savory crust faster and easier than your standard shell, but it's also a whole lot healthier. Just what we need to hear around the holidays, right? The delicious savory crust is made from a combination of oat flour and sunflower seeds. Oats make for a lovely whole-grain alternative in gluten-free baking, and they're dirt cheap compared to buying other gluten free flours. I like to make my own homemade oat flour by simply giving whole oats a whirl in the food processor. It's so easy I bet you'll never consider buying oat flour again! The addition of sunflower seeds provides an extra level of flavor in the crust – especially because we give them a quick toast before baking. Toasting the seeds is a great way to bump up flavor, and also helps make them easier to digest. And digestion is important, because there's so much good stuff in these little seeds! And, their naturally occurring oils help create a lightened up version of a standard pastry crust. Don't get me wrong, we'll still need extra fat to bring this crust together – but with the help of these little seeds, we won't need a whole stick of it. The filling in this quiche is a combination I love. The leeks are classic, the thyme keeps things fresh and the goat cheese – well, does cheese ever need an explanation? I threw in some spinach at the last minute, and I'm glad I did because the color is stunning. The combination is satisfying, but doesn't leave you feeling weighed down. And funny enough, after all these years, I could still have this quiche for breakfast, lunch or dinner. 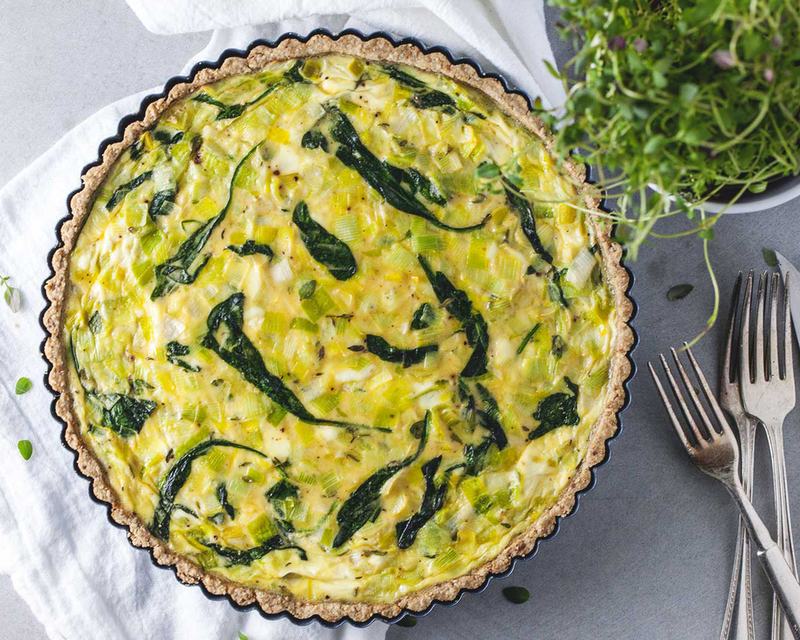 If you're familiar with quiche, you already know that it works well with all types of sides. When serving quiche for lunch or dinner, I like to throw together a simple arugula salad. 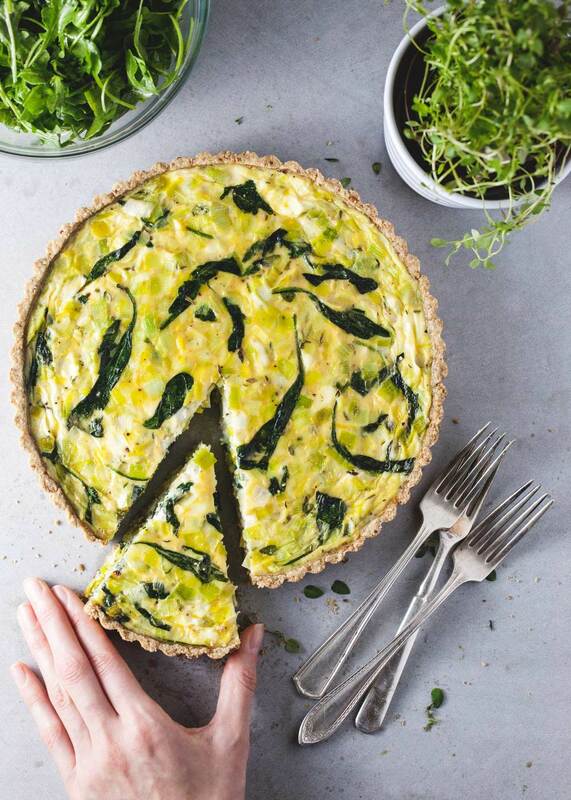 The peppery notes of the arugula pair really well with this quiche. I didn't include a recipe for the arugula salad, because I always eyeball it – and spend all of 30 seconds putting it together. It usually goes like this: large handfuls of arugula, squeeze of lemon, drizzle of olive oil, and several cracks of salt and pepper. But feel free to get creative and use whatever ingredients you have on hand. If you plan to eat the quiche for brunch instead, I'd imagine that some roasted potatoes would pair very nicely on the side. Store any extras in the fridge and re-heat the next day (or eat it cold – Anguel actually likes it better that way!). In a frying pan, toast sunflower seeds over medium heat for 5 minutes. Stir regularly to prevent burning. When seeds are fragrant and slightly toasted, remove from heat. In a food processor, blend oats until the texture of coarse sand. Add sunflower seeds and salt and blend until the seeds are also a crumb-like texture. This should only take 30 seconds - 1 minute. Add the chilled butter / coconut oil and pulse until well incorporated. Empty the mixture into a bowl. Using your hands, mix in the ice cold water until a ball of dough forms. This dough will feel quite sticky. This is normal. Wrap dough in plastic wrap and place into the back of your freezer for ~15 minutes. While the dough chills, preheat oven to 375°F. Heat a frying pan over medium heat. Once hot, add butter, leeks and garlic. Saute for 5 minutes, until soft. Add spinach and stir until wilted. Remove from heat. Remove dough from freezer and press it into prepared 9" pie pan. Aim for an even distribution of dough throughout the pan, pressing the dough together firmly to create a solid base. Using a fork, prick the bottom of the crust thoroughly to allow air to escape when baking. Aim to prick the crust ~15 times with even coverage across the crust. Bake in the oven for 12-15 minutes. Set aside once baked. Reduce oven temperature to 350°F. In a bowl, whisk together eggs, milk, thyme, nutmeg, salt and pepper. Stir in the leek and spinach mixture. Add the crumbled goat cheese and stir until just combined. Pour egg mixture into the prepared shell. Bake for 30-35 minutes, until the middle of the tart has set. Allow to cool before removing from pan. -*If you use coconut oil, make sure it is very cold. Since coconut oil is usually stored at room temperature, place desired amount in the fridge (or freezer) before using. -**To prepare the leeks, slice off the dark green tops. Cut off the root end. Rinse thoroughly. Leeks often have dirt hiding underneath the layers, so sometimes it helps to slice the stalk lengthwise before rinsing. -***Use an unsweetened, unflavored non-dairy milk. You could also use regular milk. -To prevent your crust from sticking, I highly recommend using a non-stick tart pan with a removable bottom. If you don't have one, then cut out a circle of parchment paper to place on the bottom of the pan. You may want to grease the pan as well to help it pop out easily.